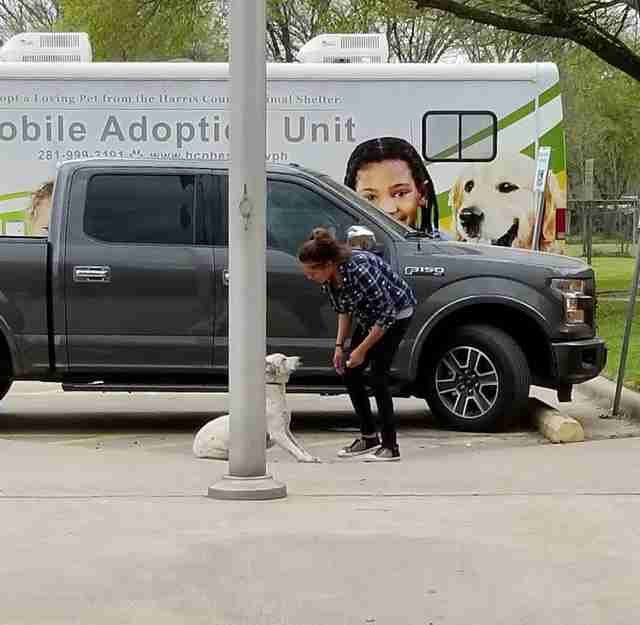 Ann Flores couldn’t believe what she was seeing — a woman was dragging a very scared and unhappy dog into the Harris County Animal Shelter in Houston, Texas. 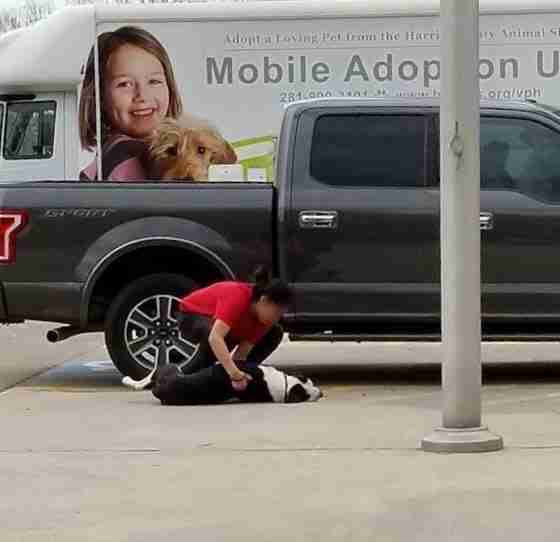 The 3-year-old dog had flopped onto the hard cement in the parking lot, doing everything he could to resist. 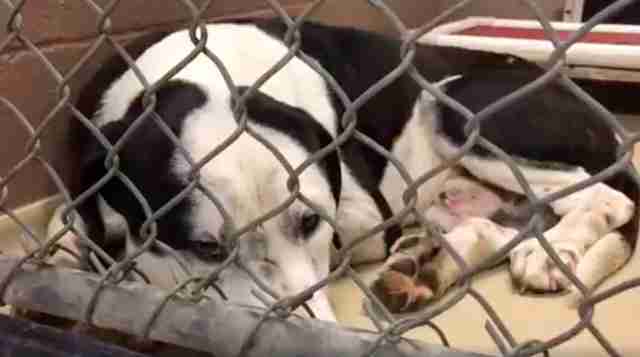 Another woman, perhaps a friend or family member of the first woman, was dragging a second dog into the shelter. Last Thursday, Flores and her friend were visiting the shelter because Flores’ friend was interested in adopting a dog. But Flores quickly became distracted by the two women dragging the dogs inside. What infuriated Flores the most was that they were laughing. Flores snapped a few photos and videos of the incident, and sent them to the Harris County Animal Volunteers, a group that works to rescue and rehome dogs and cats from the shelter. When the group posted a video of the two dogs, whom they named Truman and Mandi, people rallied to help. Cypress Lucky Mutt Rescue immediately tagged both dogs for rescue, but foster homes needed to be lined up before the dogs could leave the shelter. 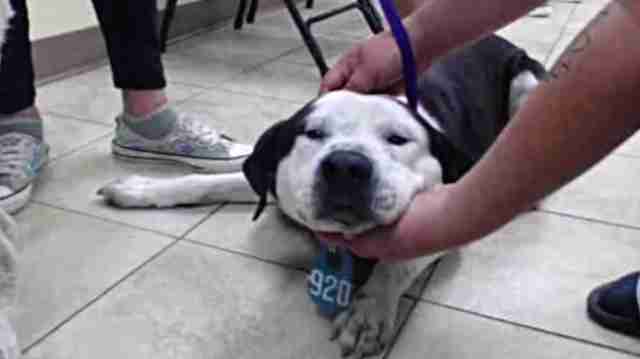 Truman, the black and white dog who’d flopped on his back, was slated for euthanasia on Monday, four days after his arrival at the shelter. His sister, Mandi, was scheduled for Tuesday. 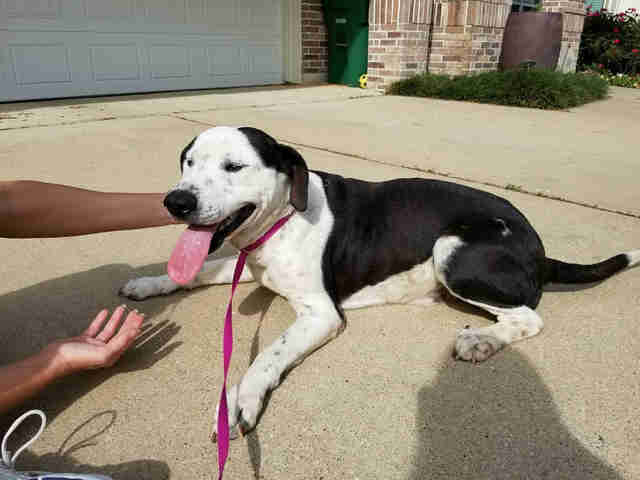 Unfortunately, the shelter couldn’t hold them any longer than that because it was overcrowded. Thankfully, the rescue group quickly found foster carers for them. Truman is still being cared for by Cypress Lucky Mutt Rescue, but it was actually Kellie Donoghue, director of Grace Mercy Love German Shepherd Rescue, who went to pick him up from the shelter on Monday. 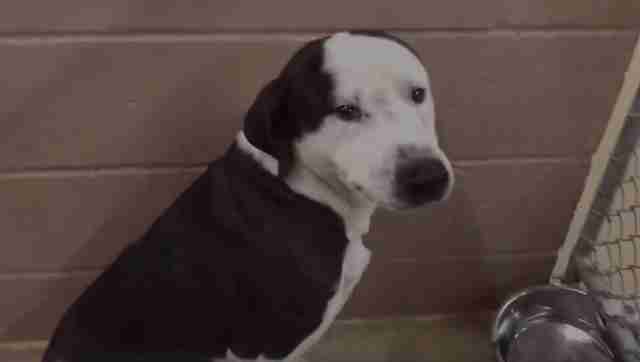 Instead of waiting for the shelter staff to bring him out, Donoghue accompanied the staff to Truman’s kennel. Shelter workers ended up having to carry Truman out to Donoghue’s car. At that point, Donoghue hadn’t gotten the chance to do a temperament test on Truman, so she drove him to a friend’s house to see how he’d react to her children, cats and other dogs. During the drive there, something amazing happened. Truman passed his temperament test with flying colors, and he became increasingly relaxed in Donoghue’s presence. 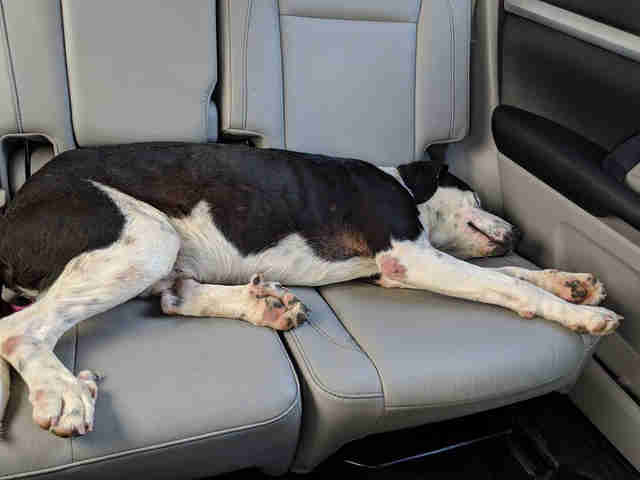 When they drove to meet Truman’s new foster mom, Truman fell asleep in the backseat of Donoghue’s car. 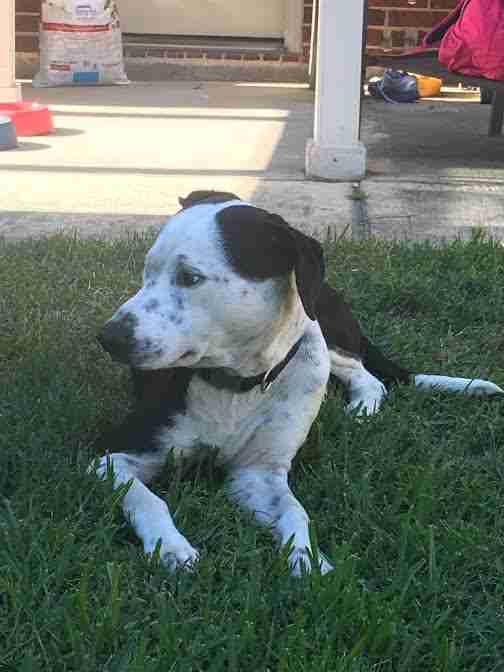 Truman is now living with his foster mom Christina Caballero and her other dog and three cats. It’s Caballero’s first time fostering a dog, and she’s loving the experience — and Truman has thrived with her. 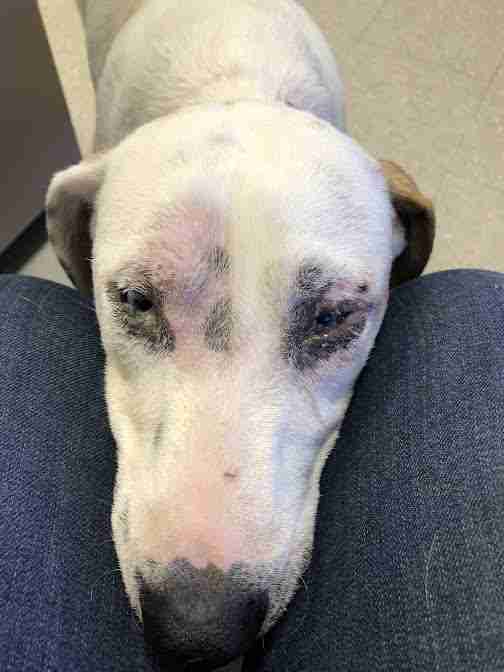 But Truman still has challenges ahead of him — he turned out to be heartworm positive, and he has to go through treatment before he can be officially adopted. He’s also struggling to learn to be indoors. Mandi left the shelter the day after her brother, and she’s now living with her foster mom, Jackie Duncan. 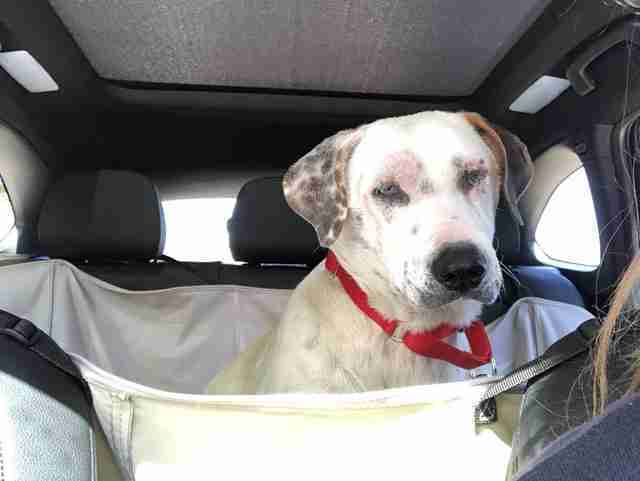 Sadly, Mandi’s also heartworm positive, and she’s had other health issues to deal with as well. Like Truman, she wasn’t sure how to behave inside a house. But with lots of love and attention from Duncan, Mandi’s slowly emerging from her shell. “She has a ton of love in her,” Duncan said. If you’re looking to adopt a dog or cat in the Houston area, follow the Harris County Animal Volunteers Facebook page.